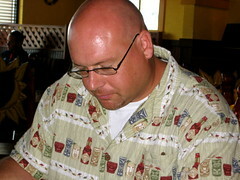 I am so behind in my blogging. But better late than never! 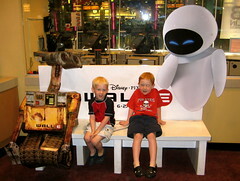 So Wednesday, July 3, CSP, Sara, Marc, Jake, Joey, and I all went to see Wall*E. Super cute! We all loved it. 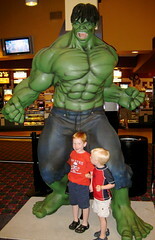 The movie theater had a giant Hulk in the lobby. 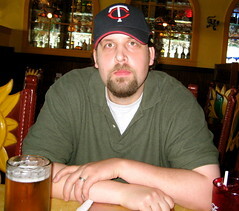 After the movie we went out for Mexican for lunch. Sara and I got HUGE margaritas. We ordered regular sizes, who knew they would bring giant fish bowls!?! I was a good girl though and finished my frosty adult beverage. 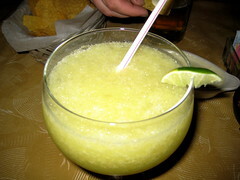 But since I don’t drink that often it went right to my head and our afternoon plans of running errands changed to Shanny sleeping off a giant margarita! I woke up to CSP handing me the phone. Jake was on the other end asking would we come swimming. So we went to their house for dinner and swimming. Big time family fun day! ohhh Im DYING to go see that movie! The girls keep mentioning it. Looks like yall had a blast. 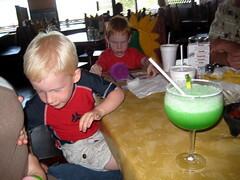 That margarita would put me under the table for SURE. Looks delicious! Sounds like a great day to me! Errands can wait.